From one of my favourite heroes (Dev Anand) to another (Jimmy Stewart). Like The Man Who Knew Too Much, I'd watched Vertigo too long ago to remember much about it. The only thing that I did remember was the shot of Jimmy Stewart hanging from a roof. For some reason, that shot had remained engraved in my memory. So, when Netflix sent me Vertigo from my queue, I was more than pleased to sit back and watch. A Hitchcock film is usually worth watching, even if we compare one to the other; this film was unusually long at 2 hours and 9 minutes., but a few minutes into the film and we were hooked. Of course, another few minutes later, my husband was saying rather disparagingly [he knows I love Stewart]: 'James Stewart playing James Stewart.' I had to admit that that was true as well. Luckily for me, the 'James Stewart' phase only lasted a couple of minutes. The film was compelling viewing. Two hands grab at the lowest rung of a fire escape; a police officer and a dark-suited plainclothes officer chase a fugitive across the roof tops. The fugitive jumps across adjoining roofs with the police officer close on his heels, the other man slightly behind. The police officer manages to keep his balance as he jumps the gap between the buildings onto a sloping roof; the other man (James Stewart) doesn't. He slips and slides down until he's barely managing to hold on by the gutters, which crumple under his weight. His colleague, hearing the noise, turns back to help him, balancing precariously on the sloping tiles while he extends an arm to help. It appears that the plainclothesman is paralysed by fear; certainly, he doesn't make a move towards his rescuer. The police officer reaches down a little more, and the man hanging almost by his fingernails can only watch in anguished terror as his colleague plunges to his death. When he is finally rescued, Detective Inspector John 'Scottie' Ferguson (James Stewart) learns that he has acrophobia - the fear of heights - which, in turn, brings on vertigo. He is not in anyway blamed for the death of his colleague, which is termed 'an unfortunate incident'. But while no one else may blame him, Scottie blames himself, and the guilt of causing his colleague's death coupled with the trauma of having nearly died himself, makes him retire from the force. He drops in on his friend (and ex-fiancée) 'Midge' Marjorie Woods (Barbara Bel Geddes) and she tries her best to dissuade him. There is no cure for acrophobia, she tells him, except that the doctor who treated Scottie told her that another emotional shock might cure it. (She doesn't look as if she believes it.) Scottie is not in the mood for another emotional trauma. If he could get over his phobia little by little, he's sure that he will eventually acclimatise himself. So he tries an experiment. He gets on a little stool in her apartment, and is quite pleased with himself when he doesn't become dizzy when he looks down from that height. Midge brings him a step stool next. Scottie manages to climb onto the first two steps. On the third, the highest, he looks down and promptly crumples into a faint. No. Scottie won't be rejoining the force any time soon, but he's a 'man of somewhat independent means' as he tells Midge, and can afford to relax for a while. However, he's had a phone call from an old classmate, a Gavin Elster, who's asked him to meet up for a drink. Midge doesn't remember him, so Scottie, not having anything much to do, decides to go see Elster. Gavin (Tom Helmore) is in the shipping industry, managing his wife's affairs after the death of her father, even though the day-to-day running of it is taken care of by his wife's uncle. Having learnt that Scottie has left the force and why, he requests Scottie to help him. Gavin is worried about his wife, Madeleine. She is in danger from 'someone dead'. Scottie offers to put Gavin onto some of his ex-colleagues in the force, but Gavin wants someone he can trust. Besides, this is not the usual thing; he and Madeleine have a very good marriage. It is just that, sometimes, he feels that Madeleine is not herself. She wanders about the city, has no recollection of where she's gone, drifts into silence in the middle of a conversation, and does not remember the break - such things. It appears that she is possessed by a spirit. Scottie scoffs in disbelief, and suggests getting Madeleine to a doctor. Gavin tells him that he wants to be certain there's something wrong. He doesn't want Madeleine institutionalised for nothing. Would Scottie do it? Would he at least come to Ernie's in the evening? He can get a look at Madeleine dining with Gavin before they leave for the opera. Reluctantly, Scottie agrees. That evening, sitting at the bar, he watches carefully, and gets his first sight of the mysterious Mrs Madeleine Elster (Kim Novak), as she stops to wait for her husband, the lights in the bar reflecting off her glorious blonde hair. Fascinated by the woman, as well as by the fantastic tales he's heard about her, Scottie decides to take up the case. First, she stops at a florist where she buys a small nosegay bouquet of red and white flowers; then, she makes her way to the Mission Dolores, where she bypasses the chapel to visit the graveyard. The grave at which she was standing, as Scottie discovers when he manages to take a quick peek, is that of one Carlotta Valdez, who died sometime in 1857. Then, strangely still, she makes her way to the Palace of the Legion of Honour, where she sits in silence before the Portrait of Carlotta (Scottie enquires the name of a museum assistant), the subject of which she resembles a great deal. Then, as Scottie continues to follow her, she walks into the McKittrick Hotel and, going up to the room on the second floor (he sees her briefly at the window)... vanishes. Now thoroughly intrigued, Scottie makes his way back to the Elsters' apartment to find Madeleine Elster's car parked in its usual spot - with the red-and-white bouquet on the dashboard. Scottie is beginning to question whether Madeleine is real. He goes back to Midge's apartment, where he asks for her help - he needs someone who can tell him the history of San Francisco. Midge is both excited and curious. Oh, not the usual kind, he tells Midge when she suggests a professor at Berkeley College, but someone who knows the local history, the stories, the people, the gossip... Midge knows just the person. He's the owner of the local bookstore, and what he doesn't know about people isn't worth knowing. Pop Leibel (Konstantin Shayne) definitely knows a lot. He gives them a quick recap of Carlotta Valdez's story - beautiful Carlotta, sad Carlotta, and in the end, mad Carlotta. The original Carlotta Valdez was a beautiful young girl who had been living with the sisters at a local Mission; by the time she was 16, she was dancing the cabaret for a living. A local wealthy man took a liking to her and removed her from her sordid surroundings, and even built a grand house for her - yes, the present McKittrick Hotel. Soon, she gave birth to his child. Her lover, now having tired of her, abandoned her but, not having any offspring himself, he and his wife adopted Carlotta's daughter. Carlotta, distraught at the loss of her baby, spent her time alone in the great mansion that now seemed like prison, often wandering the streets asking passersby whether they knew where her daughter was, and slowly descending into insanity. One day, she was found dead, apparently by her own hand. Leaving Pop in the store, Midge questions Scottie. Is Scottie chasing a ghost? He hasn't told her who he is following, but Midge makes an educated guess. Does he (and Gavin) really believe that Madeleine is possessed by Carlotta's spirit? Or that she is Carlotta reincarnated? Oh, Scottie! Scottie doesn't know what to think. He drops Midge off at her apartment, and decides to meet Gavin. There, he realises that Gavin knew about Carlotta. What's more, there is a direct link between Carlotta and Madeleine; she is Madeleine's great-grandmother. Madeleine has even inherited some of Carlotta's jewellery. He, Gavin, only knew of the connection when Madeleine's mother confided the family history to him on her death-bed. She didn't want Madeleine to know that her great-grandmother had been insane. What if? Poor Madeleine doesn't even know where she goes on her wanderings, or why; she doesn't know why she puts on Carlotta's jewellery sometimes and stares at herself in the mirror. Gavin thinks that Carlotta is exerting a malevolent influence on Madeleine from beyond the grave. 'Keep her safe, Scottie,' he pleads. The next morning, Scottie follows Madeleine again - this time, she goes to the art museum, then drives down by the coast towards Fort Point, under the Golden Gate Bridge. There, as Scottie watches from afar, she slowly pulls the petals out of the nosegay and then, before he can do or say anything, she throws herself into San Francisco Bay. Scottie runs towards the embankment and, diving into the water, pulls Madeleine to shore. She is still unconscious when he takes her to his apartment. While he waits for her to regain her consciousness, he receives a call from a worried Gavin who wants to know where Madeleine is - it's late and she hasn't returned home. Scottie tells Gavin that Madeleine is fine and asks him to call back later. Meanwhile Madeleine has recovered, and is taken aback to find herself naked, in a strange room, with a strange man. She is disarmed by Scottie who tells her what happened (she 'fell' into the Bay), assures her that her clothes are drying in the kitchen, provides her with a nightgown, and closes the bedroom door to give her some privacy to change. While they are waiting for the clothes to dry, Madeleine and Scottie have a conversation where he asks her to remember where she went and what she did. Madeleine does not understand - didn't he say she fell into the Bay? She just likes wandering around town, that's all. Scottie reminds her of the places she'd been to that day; she remembers but a few of them. Meanwhile, Gavin calls again to find out how Madeleine is and why she hasn't yet returned home. Scottie assures him that he will drop Madeleine home himself. When he hears what Gavin has to tell him next, it stops him in his tracks - Carlotta was 26 when she committed suicide. Madeleine is 26 now. The suicide attempt is a new one; perhaps he should get a doctor soon? Scottie puts the phone down to realise that Madeleine had made the best of her opportunity - while he had been talking to Gavin, she had quietly dressed and left. Later when they drive around the scenic 17-mile Drive, and stop at Cypress Point, Madeleine rushes down to the sea to fling herself into it. Scottie barely manages to stop her, and it becomes a deeply emotional moment for both of them. Scottie is now even more intertwined with Madeleine. After dropping her off, Scottie goes to meet Midge, who had dropped a note off at his place asking him to meet her that evening. In a bid to cure Scottie's obsession (as she considers it) with Carlotta, Midge, who is an artist, has painted Carlotta - a caricatured self-portrait, of course! It's her way of trying to get Scottie to see that his obsession with a ghost is laughable. Only, the laugh is on Midge. The next morning, Madeleine comes to Scottie's apartment as she had promised. This time, as they converse, Scottie has better luck. He manages to identify the place that Madeleine describes continually seeing in her nightmares - there's a livery stall with horses, a grey house opposite the white stone-washed mansion, a bell-tower - it is the Mission San Juan Bautista. They will go there together the next day, and he hopes that visiting the real-world Mission will cure Madeleine's nightmares once and for all. Finally, she makes him promise that he will not follow her into the church. But as she runs towards it, Scottie suspects something is wrong, and rushes after her. When he enters the church, there's no one to be seen. He hears hurried footsteps, however, and spots Madeleine running up the winding, rickety steps to the bell tower. He follows her, his acrophobia slowing him down, almost until the trapdoor that leads up to the top. There, he happens to look down, and experiences the same dizzying paralysis as before. As his vertigo begins to drain him, a woman screams and he can only watch terrified as history repeats itself - Madeleine hurtles past the window, her body crashing onto the roof. Frightened, burdened by guilt and grief, Scottie runs away from the scene. Later, a jury bring in a verdict of 'suicide while of unsound mind', but the judge has quite a few caustic remarks to make about Scottie's role in the 'accident'. Gavin, however, makes it clear that he, in no way blames Scottie for what happened, and apologises for the judge's harsh criticism of Scottie. However, Scottie is a broken man. Distraught, he visits Madeleine's grave, and begins to suffer from nightmares himself. He blames himself for not saving Madeleine, for allowing his fear of heights to paralyse him when he was most needed. Finally, his grief, his guilt, and remorse weigh him down so much he has a nervous breakdown and is institutionalised. When Midge visits him at the clinic, she finds him depressed and in an almost impenetrably numb state. Clearly, he hasn't recognised her, or even understood that she's come to visit him. Sadly, Midge leaves. Fast forward a year later, and Scottie has been released from the sanatorium. He's not the old Scottie however, and drifts aimlessly like a lost soul in all the places Madeleine had once visited. In his imagination, he sees her everywhere. It is a slow descent into madness. Until one day, he does see her - Madeleine - again, though she looks different. Is it really she? Have the Fates given them a second chance? Or is Scottie going mad? This is but half the film; the rest is yet to unwind in very unpredictable ways. 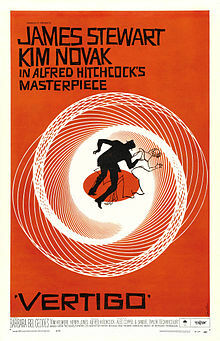 On the face of it, Vertigo is our basic suspense thriller. Dig deeper, it's a psychological thriller, dealing with a man who is so burdened by guilt that he needs to find an outlet for all those repressed emotions. What pulls the viewer into Vertigo, however, is that for the longest of time, we are not told what is happening. Unlike many other Hitchcock films, where we not only know what happened, whodunnit, but why, and how, here, like Scottie, we aren't sure whether what we are seeing is not a figment of our deranged minds. It is easy, so easy, to be trapped in what are essentially mind games that, along with Scottie, we find ourselves descending into the madness of our fevered imaginations. We see the beginnings of Scottie's obsession when he first begins trailing Madeleine. He follows her through the florist's, the museum, the graveyard, the streets of San Francisco. (If he weren't the 'hero', he would be a stalker.) 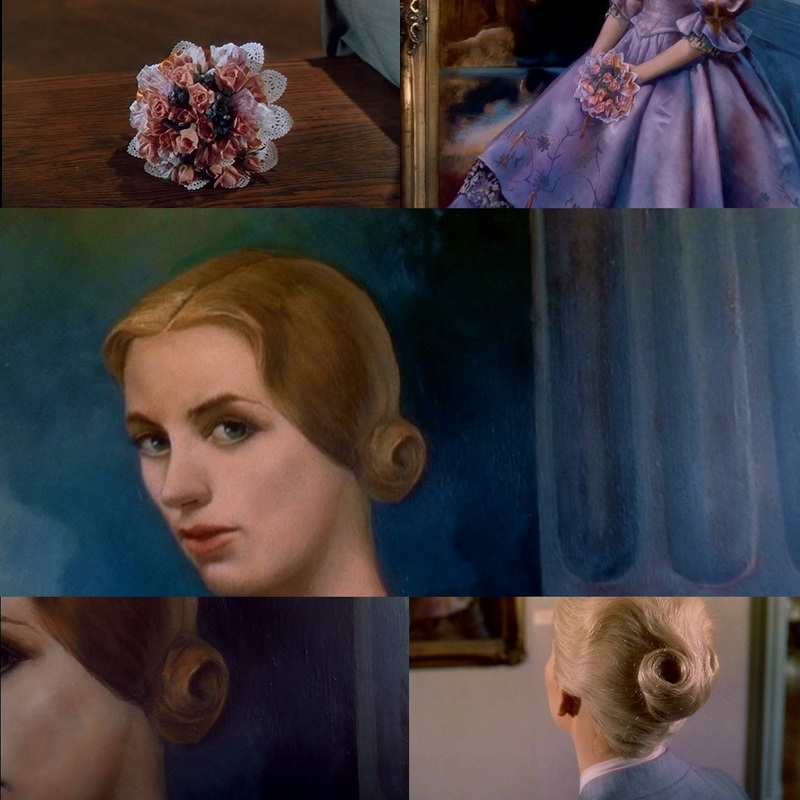 The more he sees of her, the more he talks to her, the more he begins to believe that she is, if not a reincarnation of Carlotta, then possessed by her spirit. Certainly, she herself believes it, is frightened by it. When he eventually traces the roots of her fear to the Mission at San Juan Bautista whose very walls and flagstones are steeped in the ages, he hopes he will be able to eradicate her fears. Little does he know that it will not only become the scene of her death, but also the place where he will eventually overcome his acrophobia. As her death drives him to a nervous breakdown, he has to claw his way back to sanity. In his fragile state, however, seeing Judy Barton only blurs the dividing line between reality and fantasy. Not just for him, but for us. Apparently, however, most critics felt that the scene worked where it was because it gave the viewers Judy's motivations for behaving as she does. Certainly, the audience at the first trial show did, and according to Dan Aulier, author of Vertigo: The Making of a Hitchcock Classic, Alma Hitchcock had the last word on her husband's films, and she agreed with those who said the scene should be reinstated. So it was. Hitchcock favourite James Stewart is back headlining the cast, and after the initial couple of scenes with Midge where he 'played at being James Stewart', he convincingly portrayed how a man can break down under the twin burdens of guilt and obsession. As he slips further and further into that quagmire, he begins to move from being an object of sympathy to an object of horror. There is something menacing about the way he transforms Judy into Madeleine à la Pygmalion making over Galatea. You can almost see the beginnings of stark insanity in Scottie's eyes as his obsession takes over his rational sense. The manipulation, even degradation, of women in this film is horrifying. Neither as Madeleine nor as Judy Barton is her character allowed a voice of her own, a will of her own, a personality of her own - all she is, is clay to be moulded into an object of men's desire. There is something sadistic about the makeover, and I do not think I have ever seen such a chilling performance from Stewart. Ever. She is both Madeleine Ester and Judy Barton, and she at least seemed human as the latter. I could still have done with an Ingrid Bergman or a Grace Kelly in this role - perhaps Hitchcock's own obsession with icy blondes finds reflection here. But of Madeleine/Judy, the role(s) that she played, Judy is perhaps one of the most sympathetic characters in a Hitchcock film. A woman made over by one man to imitate another so he could use her as a red herring; then a woman made over again by another man to look like a reflection of the woman she was when she first met him, a woman he loves beyond all belief. Neither of the men love the real her. She agrees to the second makeover knowing she will be opening a can of worms if she makes a slip because she loves Scottie. So much so, she doesn't care that he really doesn't see her, just the reflection of his beloved in her. Barbara Bel Geddes, on the other hand, could wring emotion out of a stone. As Marjorie Woods, a.k.a Midge, she is wonderful. She is Scottie's friend and well-wisher, the one who takes care of him, who cares for him... at one point in the film, she tells him not to worry, 'Mother's here.' As it turns out, we are told that she and Scottie were once engaged. ('For three whole weeks', says Midge.) For a couple who have broken off their relationship, these two are remarkably friendly. Scottie, in fact, never fails to remind her that it was she who broke off the engagement. And 'I'm still available.' Funnily enough, it is clear to us, if not to Scottie that she's still carrying the torch for her 'Johnny-o'. There are two scenes where she stands out - one where she's driving past Scottie's house, and sees Madeleine step out of it. As the other woman drives away, Midge ruefully remarks to herself: 'Well now, Johnny-O, was it a ghost? Was it fun? She, down-to-earth, practical commonsensical Midge, cannot compete with the elusive, mysterious Madeleine. What makes Vertigo such an engrossing watch is that you cannot predict what's going to happen next. Even when it follows a somewhat predictable path, it still manages to sucker-punch you at various points. This is also one of the few films of the day that did not show the villain being punished for his sins. Apparently, (again, according to Wikipedia), there was an alternate ending that had a voice over that hinted at his getting his just desserts. However, Hitchcock's will prevailed here, and the film ended just as he wanted. I haven't mentioned one very important part of this film - its music. Composed by Hitchcock regular Bernard Hermann, it was however conducted by Muir Matheison, and recorded it in London and Vienna. A musicians' strike in the US prevented Hermann from conducting his own music. It was the music that added much to the tension; it is so beautiful that, immediately after we finished watching the film, my husband went off to order the sound track of the film. [Over to my husband for some notes on the music:] ​Prior to Vertigo, Bernard Hermann had worked with Hitchcock on three other films. For Vertigo, Hitchcock provided little direction for the music leaving Hermann to explore his own ideas. 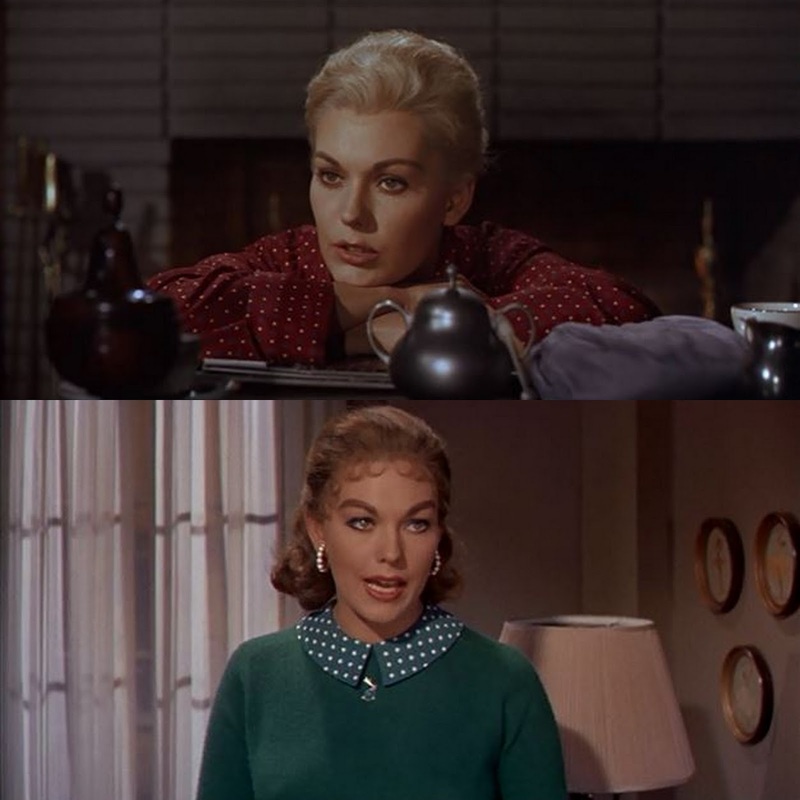 Vertigo is probably the best music score by Hermann for Hitchcock. Right from the opening music where a three-note movement ascends and descends simultaneously on different instruments and heightens the feeling of suspense, to the advent of the brass horns and the breathless rushing of the strings that signifies the chase on the rooftop, to the dissonant chords that follows the police officer to his death, the music subtly influences the scenes that unfold on the screen. There have been comparisons to Wagner regarding the music in this film. However Hermann rarely uses the concept of a leitmotif à la Wagner except in one case. The love theme that follows Madeline seems to be a reflection of Scottie's feelings for her. Is this the mind of a man already teetering on the edge of insanity? Is Scottie really sane or is his acrophobia just the tip of his issues? The music is peaceful and romantic at times, but ominous at others. This brief theme is repeated throughout the film whenever Madeline makes an appearance, and variations on it are played whenever Scottie looks at her through different eyes. he music is always written from the point of view of Scottie, through whose eyes we see the different characters and moments. For example, when Scottie sees Madeleine, in the museum, look at a portrait of a lady who seems to have Spanish ancestry, we hear a habanera rhythm. Are these his thoughts or is it Hermann hinting? Whenever Scottie sees death or faces some form of mental trauma there are always dissonant chords. The one scene where the music is devoid of Scottie's point of view is where Judy confesses everything to him in a letter that she eventually tears up. Here, Hermann uses themes from different parts of the film including the opening credits, the love theme, a habanera, etc. Even though the music ends on a final harmonious set of notes, its undulations as the film nears the climax leaves the viewer feeling somewhat like Scottie as he looks at the dead body of the woman he fancied himself in love with - his vertigo cured, but everything else incomplete. Today considered a classic and one of Hitchcock's best films (he certainly considered it among his favourites), Vertigo is a thriller, the likes of which you never get to see. Usually. If you're ever in the mood for a psychological thriller, do watch. You won't regret it. P.S. Alfred Hitchcock appeared in his traditional cameo, walking from left to right of the screen, carrying a trumpet outside Elster's shipping company.